• Drawing the key poses, breakdowns and then the in-betweens. • Check the line test and comeback to the animation if more frames are needed. 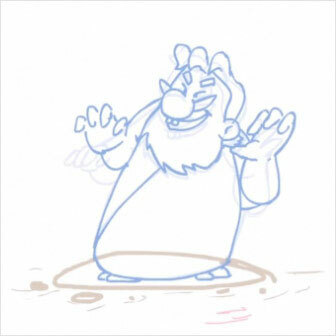 In character animation ‘ARCS’ are very crucial. In basic human motions like - A head rotation, a walk or any other action, our body does not move in a linear fashion, it follows an arc all the time. So always animate with arcs in mind, as it will make your actions believable and much richer in its motion. Also, principles are the key part of animation without which your animation would look lifeless. So principles like anticipation and adding cushion at necessary places in your animation is important. Remember no human action start or stops abruptly, it always starts with anticipation at the beginning and eases or settles down as it ends. So adding a few frames to give a cushion to the actions helps the action look smooth and believable. Also one can play with squash and stretch in a character if necessary. To keep a check of your volumes keep flipping (as explained in the video).This not only helps you check the volume but also gives you a quick feedback of the motion. • Refer to the videos for further practical details.